"Mission Statement & Evaluations Build Momentum"
A Sequoyah education challenges the mind, nurtures the heart, and celebrates human dignity. I am an architect, a LEED AP, and chair of the Sequoyah School Sustainable Campus Committee. While Sequoyah has a strong environmental tradition, we needed to organize and evaluate our status. We developed a Mission Statement to guide us in taking care of people, things, and the environment and making the community a better place for all. Using our existing foundation of collaborative, hands-on, place-based learning, we inculcate practices that encourage careful use of resources and lasting change. We established a Sustainable Campus Committee, made up of staff, faculty and parents, which wrote the Sequoyah School Sustainable Campus Criteria. From that we have established annual work plans. We mentor the Green Committee, a sub-committee of the Student Government, to foster student initiatives. Sequoyah School has addressed greening on many fronts simultaneously, improving practices and educating the community in the process. Buildings and Grounds: We undertook the Gardens for Learning construction project during the summer of 2008 to improve neglected outdoor areas on campus and establish outdoor classroom space and gardens. We design our construction projects using best materials and LEED concepts; construction waste is reused and recycled. We have composted for years, and have continued to develop and expand composting. We have an ongoing tree planting program. Food and Events: We hold "Waste Less Wednesdays," during which we “talk trash” with students, and sell waste-free lunch kits to reduce trash creation. We hosted a produce share among our community. We minimize restaurant take-out food and disposable items for all campus events. We use reusable dishes for all campus events to reduce waste, and we often call upon volunteers to wash dishes. Our large annual fundraiser was “greened” from concept to implementation, educating everyone in the process. Transportation: We do outreach to foster carpooling using an online directory of families by zip code, and we installed a bike rack. We switched to more environmentally friendly buses rented for school trips. Energy efficiency: We installed motion sensor light switches and fluorescent fixtures throughout campus, and are currently auditing our energy use. Purchasing, Cleaning, Disposal: We've audited all of our purchasing and are improving it. We implemented a disposal policy for unwanted school equipment. Now only green cleaning products are used throughout campus. We established a Sustainable Campus Committee, made up of staff, faculty and parents, which wrote the Sequoyah School Sustainable Campus Criteria. Students are involved in sustainable education and greening on a variety of levels. The Sustainable Campus Committee mentors the Green Committee, a subcommittee of the Student Government, to foster student initiatives. Each class tends a garden plot, and students are responsible for maintaining the compost. During the summer of 2009, Sequoyah built the Gardens for Learning, an outdoor classroom supporting each class's investigation into essential questions for habitat construction. 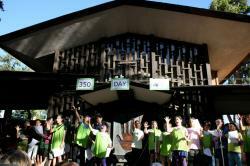 Each classroom goes on three-day to two-week camping trips once or twice each year. Students helped make napkins we sold with waste-free lunch kits. The money generated from these sales are funding Sustainable Campus Committee Grants for student-initiated environmental projects. In 2010, Pam Tuttle of the California Student Sustainability Coalition hosted a weekly Options class entitled "Leadership Development and Social Change" for a small group of students. At the end of their 10-week session, this group applied for and was awarded the first Sustainable Campus Committee Grant, to replace an existing campus toilet with a dual-flush toilet. Josh Brody, Sequoyah's Director, formed the Sustainable Campus Committee in the fall of 2007. The Committee got right down to business, and has had a big impact! Our biggest assets are the knowledge and resources of our school community. We have also drawn guidance from these organizations and online and print resources: The Green Schools Initiative at greenschools.net, 350.org, EnvironmentLA.org, Greenopia.com, energystar.gov, responsiblepurchasing.org, greenseal.org, creativegreen.net, Toxics Use Reduction Institute at turi.org, National Audubon Society at audubon.org, USGBC LEED, Sunset Magazine (green garden guidelines), Park Day School (Green School information), City of Pasadena Environmental Advisory Commission, Pasadena Green City Report and Green City Action Plan, The Center for Ecoliteracy, Barbara Kingsolver's Animal, Vegetable, Miracle, Michael Pollan’s books, 2006 UN Green Cities Declaration and Urban Environmental Accords, The Cloud Institute for Sustainability Education, Colin Beavan (a.k.a. "No Impact Man"). Our community has a lot of energy for building a sustainable school. Achieving success with the many projects we’ve been working keeps our momentum going. In Dec 2009 Sequoyah School was awarded the City of Pasadena Outstanding Recycler Award for development of a reduction, reuse or recycling program. At the end of the school year we’re going to have a celebration marking our successes with painted leaf signs on a tree - see the attached image, bare of leaves to date. Our Work Plan is continually evolving -- there is always something more we want to do! Next year we hope to green our turf akin to Harvard’s yard project (organic landscaping practices). Sequoyah commissioned a Capital Needs Assessment that we will continue to review for opportunities to implement best environmental practices as opportunities arise. A campus-wide electrical audit should be completed at the end of the '09/'10 school year and improvements will be implemented as appropriate. We’re continually looking for ways to reduce paper use on campus and providing guidelines for recyclable content papers. We plan to implement Integrated Pest Management goals. We’re always striving for better carpool rates. We’re considering hosting a CSA drop point. We need to better assess our water supply and need for additional filtration.... The opportunities abound! Make use of the resources at hand. The support of the administration, staff, faculty, and families has been our biggest asset. The interests and skills of school community members has opened up so many new ideas and opportunities. Sharing ownership among our entire community has provided us amazing resources to draw from, improving and greening our school and homes. Sequoyah School Sustainable Campus Committee Mission Statement: Sequoyah's Habits of Mind defines stewardship as: taking care of people, taking care of things, taking care of the environment and seeking to make the community a better place for all. The Sequoyah School Sustainable Campus Committee works with all aspects of the school community to be stewards of our future and of our environment. Using Sequoyah's existing foundation of collaborative, hands-on, place-based learning the Committee seeks to inculcate practices that encourage careful use of resources and lasting change. In celebration of our school's 50th year, the Sustainable Campus Committee undertook an evaluation of our ecology, economy, and community to create the Sequoyah School Sustainability Criteria. Categories for the Criteria are taken from the UN Urban Environmental Accords, and are those that have been adopted by the City of Pasadena, LEED, and others. The Criteria illuminate existing successes to be built upon, while providing direction for Sequoyah to move into the future. The Criteria are used by the Sustainable Campus Committee to inform an annual sustainability plan which will be reviewed by the Board of Trustees' Long Range Planning Committee.